Coates Residence, 2015. Photo courtesy of Edmonton Planning and Development. The floor in Jesse Watson’s Calder bungalow is stamped with words like “wheat” and “barley,” clues to a fascinating past. Times were tough in 1931 and the house, like many others in the neighbourhood, was partially built using materials scrounged from the nearby Canadian National Railways yards. Supports were made from recycled wooden beams and its subfloor was laid using wood from a broken down boxcar. 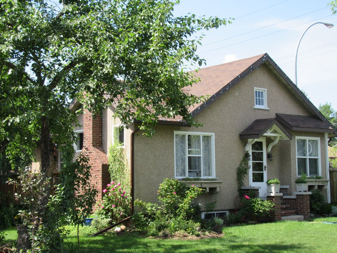 Recognizing its significance, Watson applied to have the British Arts and Crafts Revival style home designated a Municipal Historic Resource, and City Council approved the application late last year. The designation will provide funds to help him restore historic components of the 85-year-old property. David C. Coates built the house using recycled lumber and hand-thrown pebble, glass and shell-dash stucco cladding on the facades, the report says. Frederick Stanley Jones, a talented stonemason and bricklayer who had lived across the street and who had sold the property to Coates in 1920, constructed the chimneys and front entry steps using locally manufactured clinker brick. “Coates designed and built the house inspired by the Aladdin Company’s Lorraine house plan, which was available in the 1930s,” the report states. The British Arts and Crafts Revival style can be seen in the home’s front-gabled canopy supported by curved brackets flanking the main entry and stucco-clad window boxes supported by false beams. Using recycled materials was also typical of the time. During the Depression and then through World War II, materials and money were in short supply, and builders and homeowners found ingenious ways to get the job done. It was also a great way to reduce the cost of construction. The practice continued when boom times returned after the war, and materials were sometimes hard to obtain because the demand was so high. In Beverly many of the houses were framed and floored using timbers from the coal mines that burrowed in from the river valley and under the feet of the townspeople. Coal Mining Trucks at the Beverly Coal Company c. 1937. Photographed by H.A. Hollingworth. Image courtesy of the City of Edmonton Archives EA-160-218. There was no money to buy timber for cribbing supports for the new Beverly Coal Company mine, so in 1931 some sidewalks in the town were ripped up and boards bolted across 12-by-24-inch timbers transported from the nearby Canadian National Railways yards. More recycled wood was used to construct the tipple at the mine entrance, east of 43rd Street and south of 112th Avenue. When the mine closed 20 years later, wood was again in short supply and some of the planks and joists were used to build nearby houses. Railway boxcars were also sometimes used as housing. Immigrant farm workers streaming into Edmonton in the 1920s worsened an already acute housing shortage, and many of them ended up crammed into whatever shelter they could find – be it boxcars, shacks or basements. During the hard times of the 1930s, the land at the bottom of Grierson Hill became a tent city where dozens of homeless people lived. Family of Joseph Delorme live in boxcar dated November 7, 1949. Photographed by Eric Bland. Image courtesy of the City of Edmonton Archives EA-600-3246a. “Alberta’s early settlers demonstrated a strong pragmatism and a remarkable inventiveness in response to their need for shelter,” wrote Donald Wetherell and Irene Kmet in their 1991 book Homes in Alberta. Logs, earth, tents, milled lumber, brick, stone and cement have all played a part in the history of housing in the province, as builders answered buyers’ preferences with the practical reality of materials readily available. Some of the lumber used in Alberta in the early 20th century was old-growth Douglas fir from British Columbia, popular because of its quality and available thanks to railway transportation. While most of this imported lumber was used for finishing work, many houses were also framed with B.C. lumber, Wetherell and Kmet note. Several Alberta mills, including D.R. Fraser and Co. in Edmonton, processed rough B.C. lumber into finished building products. A handful of Edmonton buildings, including Christ Church Anglican Church, used enormous beams of Douglas fir for roof supports. Companies like Edmonton’s Urban Timber sources used planks and beams from all over North America and parts of Mexico. They’ve turned beams from a tobacco factory in the southern United States into dark flooring and planks from rafters in Milwaukee’s original 1884 Pabst brewery into feature wall pieces. Now barn wood, and most especially old barn doors, are most requested items. After decades of sun, wind and rain, vintage wood has a weathered character that is unique and appealing to owners looking for distinctive materials with stories to tell. Well-used metal and hardware fixtures like doorknobs, hinges, frames and brackets are also finding their way into more home renovations and even new construction.